Small - $64.99 Medium - $64.99 Large - $72.99 Only 9 left! Honey Lemon always has something kind and positive to say, she's a huge nerd when it comes to chemistry, and she's a super hero! Talk about a great role model for your little one! The Disney feature film Big Hero 6 portrays science as the fast track to becoming a superhero. So, if your little girl has been hitting the books pretty hard lately, maybe, its time to accept the fact that she's going to be saving the city one day. Rather than spending your time worrying about your little one getting in over her head, why don't you lend a helping hand in preparing her for her heroic role. 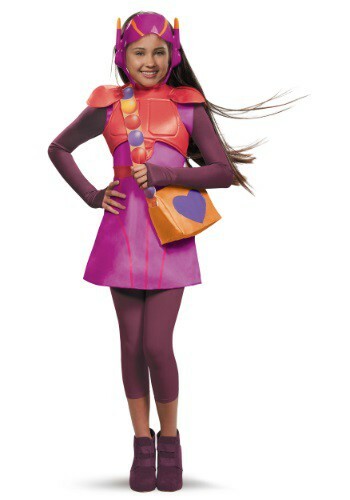 You can start with this Girls Honey Lemon Deluxe Costume! Designed to match the exact look of Honey Lemon's superhero outfit from Big Hero 6, your little girl with be ready for action when she throws this costume on. Make sure she has her Power Purse handy! This bag of tricks, in the movie, allowed Honey Lemon to blow up whatever she needed too, set up traps for the bad guy, and even helped to make safe escapes when things got a bit out of control. Your little hero, hopefully, won't need to cause any explosions just yet, but she will look stunning with her own Power Purse hanging down from her shoulders. Have your cameras ready because, although she'll be more photogenic than ever, your kiddo is going to have cities to save and bad guys to take down.